How Do Instant Ice Packs Work? An instant ice pack is a plastic bag filled with frozen gel that is capable of maintaining extremely low temperatures for an extended period of time. Unlike traditional ice packs, instant ice packs do not need to be stored in a freezer before use and can freeze instantly through a chemical reaction. Instant ice packs are used therapeutically and are useful in emergency situations since they can be transported at room temperature. Many people also use instant ice packs in coolers to preserve meat, dairy products and other types of food. Instant ice packs use an endothermic reaction between water and ammonium nitrate to achieve cool temperatures rapidly. An endothermic reaction occurs when two separate compounds interact to absorb energy in the form of heat. Before it is used, an instant ice pack contains both water and ammonium nitrate in separate tubes. When these tubes are broken, the water and ammonium nitrate mix, setting off an endothermic reaction and causing the water to freeze. The freezing of the water prevents all of the ammonium nitrate from instantaneously mixing with the water. As the ice melts, the water mixes with additional ammonium nitrate, causing additional endothermic reactions and forcing the melted ice to re-freeze. This process allows instant ice packs to remain frozen and maintain extremely low temperatures for an extended period despite being stored or used at room temperature. Instant ice packs are extremely useful for preserving food, particularly in situations where it is not possible to refrigerate food for long periods. 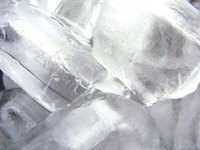 Unlike pure ice, the water from instant ice packs cannot mix with food. Instant ice packs are also significantly more powerful that pure ice: four ice packs, when stored with food in a cooler, provide the same chilling power as 10 to 20 pounds of ice. Instant ice packs are also used extensively by medical professionals in both emergency and non-emergency situations. Cold temperatures cause muscles to numb and constrict, preventing the muscle from being overworked and allowing it to heal. Instant ice packs are smaller and much easier to transport than pure ice, making ice packs a favorite tool of physical therapists. Instant ice packs are also reusable, which makes them more cost effective than pure ice. Do Cookies Baked With Fruit Preserves Need to Be Refrigerated?